Ordination is Free & Easy. The Universal Life Church (ULC) is a non-denominational spiritual organization that opens its doors to anyone seeking to get ordained. The ULC is proud to welcome people of all cultures, creeds, and belief systems. Since its inception, over 20 million ministers have become ordained online worldwide through ULC ordinations. The Universal Life Church provides a broad level of support to you whether you will be officiating at a wedding or are planning to start your own church. As an ordained minister of the ULC, you will possess the full legal status required to officiate marriages. In addition, you will be qualified to perform baptisms, preside over funerals, and conduct any other religious ceremony of your choosing. Becoming a legally ordained minister through the Universal Life Church Ministries is a simple process. After completing the ordination form, you will receive a confirmation email which serves as receipt of your ordination. Please read this email carefully, for it contains important information about your ordainment. Only put your true, full legal name (*nicknames will invalidate your ordination). Double check your name and email address. Capitalize where appropriate, as this is how your ordination will be reflected in our records. Submitting an ordination request using a fictitious name, the name of another person, or an animal's name is not allowed. All such applications are considered invalid and these ordinations will not be recognized. If we have discovered that you have submitted an application for ordination using false or fraudulent information, we reserve all rights to revoke your ordination. For more information, visit our ordination FAQ page for answers to the most common questions surrounding online ordination. By joining the ULC, you become a member of our online church community. There are multiple platforms through which you can interact with your fellow ministers in the ULC family. We suggest you begin the journey by joining the ULC Minister's Network, our very own social networking site. Simply create a profile and start connecting with this friendly group of like-minded individuals. You can also find us on Facebook! Our official Universal Life Church Monastery page invites discussion on a wide variety of religious news items and current events. Finally, make sure to visit the ULC Blog to see what’s been on our mind lately. We encourage you to share your thoughts in the comments section below each entry. As a member of the online Universal Life Church community, you can share ideas and propose strategies to help bring our spiritual community closer. If you have a question or would like to raise a particular concern, appealing to the collective wisdom of this vibrant ministerial community is a great place to start. For those of you who are seeking ordainment online to officiate a friend or family member’s wedding, the ULC provides a number of tools to assist in the process. From our easy-to-use wedding ceremony script generator, to step-by-step guidance on performing weddings, to our comprehensive wedding laws page, we provide everything you’ll need for a successful ceremony. Upon becoming ordained, some of our ministers are inspired to start their own physical or internet ministry. If this interests you, the ULC offers a full range of resources to support your efforts. Our Ministerial Training Center includes guidance on everything related to running a church, from financial matters to ceremony instructions. Even more specialized information on these topics can be found in our extensive literature catalog. How Do I Get Ordained? 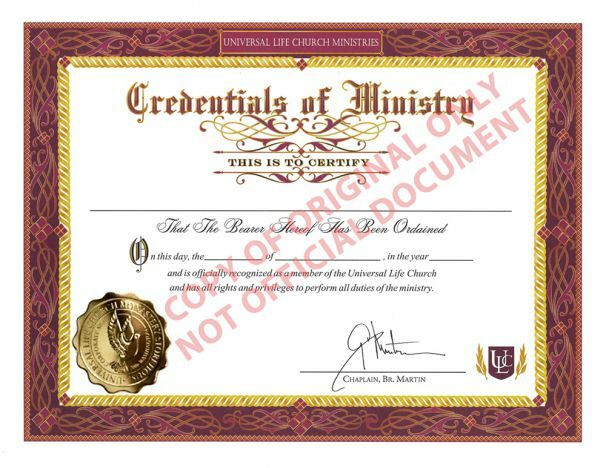 Have your friends been wondering how to be a minister or how to become a marriage officiant? Well, now you have an answer for them. You know how to become a licensed minister, and the process starts here! Whether your goal is to be a full-fledged ordained pastor, a marriage officiant, or simply to conduct spiritual ceremonies, the journey begins by clicking the button below!